The British Foreign Secretary told Parliament on February 18, 1947 that “there is no prospect of resolving this conflict by any settlement negotiated between the parties.” Further, he said, according to the League of Nations mandate, the legal basis for Britain’s rule over Palestine, Britain did not have the authority to partition the country as everyone thought would be necessary. Thus, the British government had decided to turn the problem over to the United Nations. The Foreign Secretary did not mention, but it was obviously a significant factor, that Britain could no longer afford to keep nearly 100,000 troops employed in an increasingly vain effort to keep the peace in what was in comparison to India a relatively unimportant area. UNSCOP was to be composed of a diverse group, representatives of Australia, Canada, Czechoslovakia, Guatemala, India, Iran, Netherlands, Peru, Sweden, Uruguay and Yugoslavia. As diverse as the committee was, its members shared one characteristic: none of them knew anything about Palestine. And they could not expect that they would get a “balanced” view since the representative of one party, the Palestinians, decided to abstain from collaboration with UNSCOP. In default of the Palestinian voice, the general ignorance of the members of the Committee and sporadic demonstrations in Palestine against its inquiry, the Jewish Agency dominated the proceedings. Despite these problems, UNSCOP set out, or at least signed, a generally fair and informative appreciation of “the Elements of the Conflict” in its Report to The General Assembly. In summary, it portrayed two populations, one European, technologically advanced, united and determined, numbering about 600,000, and the other, numbering 1,200,000, Asian, divided both religiously and geographically into about 1,200 autarkic, self-governing communities and “native quarters” of the few cities, suffering from all of the inherited problems of colonialism, living in one small (26,000 square kilometer/10,000 square mile) area of which “about half …is uninhabitable desert” with seasonal and limited rainfall and access to ground water only from fragile and (what ultimately have proven to be) endangered aquifers. Palestine was almost totally without minerals other than the potassium and sodium salts of the Dead Sea. To found their claim on their dispersion from Palestine after a period of approximately 2,000 years, whatever religious sentiment may be attached by them to the land occupied by their Prophets, appears to me to be as groundless as anything can be. A multitude of nations conquered various countries at various times and were eventually defeated and turned out of them. Can their connexion, however long, with the land which they had once conquered provide them with any basis after the lapse of even one century? If this were so, Moslems might claim Spain, which they governed for a much longer period than the Jews had governed part of Palestine…[moreover] this claim cannot be made by those who were subsequently converted to Judaism. Khazars of Eastern Europe, Turco-Finn by race, were converted to Judaism as a nation about 690 A.D. Can their descendants possibly claim any rights simply because the ancestors of their co-religionists had once settled in Palestine. The Arab Higher Committee also made two further arguments: first, that “the term ‘Arab’ is to be interpreted as connoting not only the invaders from the Arabian Peninsula in the seventh century, but also the indigenous population which intermarried with the invaders and acquired their speech, customs and modes of thought in becoming permanently Arabized.” It is the descendants of this mixed group, they said, who the current Palestinian “natives.” And, second, they claimed “acquired” rights, which derived from the various British promises during and immediately after the First World War. 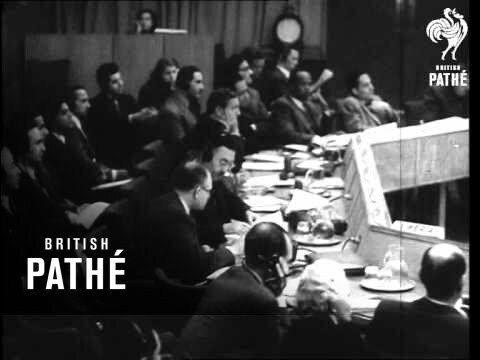 After reviewing the reports, listening to emotional appeals by various delegates, individuals and groups and following orders transmitted by their home governments, the delegates to the UN General Assembly voted (Resolution 181) on November 29, 1947, 33 to 13 with 10 abstentions, despite strong opposition by Arab member states, to recommend partition of Palestine.. The key feature was that it awarded the incipient Jewish state, whose citizens-to-be owned or controlled less than 6% of the land, 55% of the Mandate.